One hundred percent was given to us. We, in turn, give 100% to our Wounded Warriors. St. Thomas More Parish has contributed significantly each year on Veterans Day Weekend to a good will offering for amputee veterans. Our knights stand in the narthex after each mass from Saturday night through to the Spanish Mass on Sunday. They stand vigil over buckets that wait for the generosity of our parishioners. We have a six-year history of generous giving. We have been generous during good years, but we have been just as generous during the past few years when we were hit the hardest. 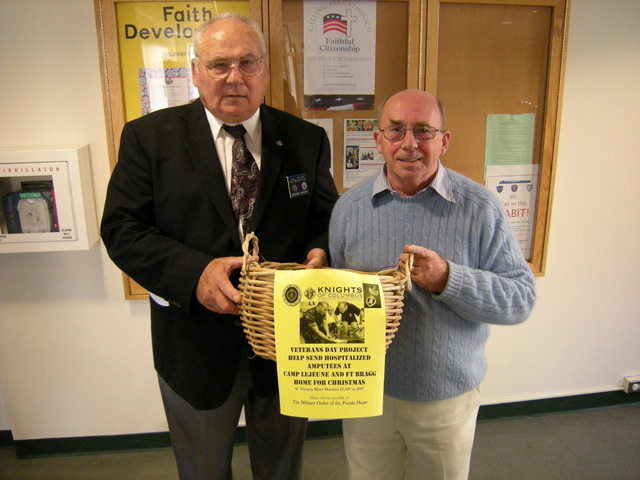 All cash donations are collected and placed in the care of the church and the church sends a check for the combined collections to the Military Order of the Purple Heart, Wounded Warrior Program. Every dollar is matched to double the value of our gift. If you would like to make a donation by check, please make your check payable to Military Order of the Purple Heart. Put in the memo section: Wounded Warrior Program. The Military Order of the Purple Heart will send you a tax receipt and thank you. The Military Order of the Purple Heart project is a 501(c)(3) donation and is tax-deductible. There are no administrative costs to this program. One hundred percent goes to send our warriors home for Christmas.